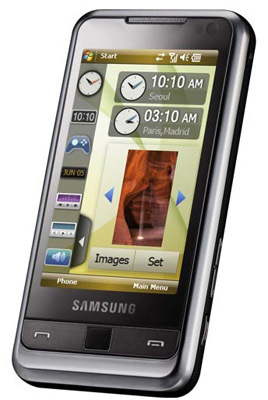 Review Samsung's attempts at touchscreen mobiles have been lacklustre to date. The F700 and F490 work, but they don't make the case for touchscreen control in the way that the iPhone and HTC Diamond do. The first thing that strikes you about the Omnia is the specification, which is nothing if not comprehensive. Quad-band GSM/GPRS/Edge, 7.2Mb/s HSDPA 3G, a five-megapixel autofocus camera, GPS, 802.11b/g Wi-Fi, an RDS FM radio, TV out, A2DP Bluetooth, 16GB of internal storage with Micro SDHC expansion, and support for XviD and DivX video codecs. All in all, not shabby. Physically, the Omnia is a bit iPhone-lite, weighing 125g and measuring up at 112 x 57 x 12.5mm. It has a 3.2in, 240 x 400, 65,000-colour screen. Though a rather plastic affair, the Omnia feels solid and is slim and rounded enough to slip in and out of a pocket with ease. Its external controls are limited in number: below the screen are the usual call keys and a simple action key that also doubles up as a “finger mouse” pad – more on this below. On the right side of the handset are keys to call up the main menu – if held down this key pops up a list of all running applications – control the volume and activate the camera. Up top is the on/off key, while on the left is the Samsung multifunction port. And that's your lot. Anyone in the habit of swapping their SIM or memory cards regularly, be warned: you have to remove the Omnia's battery to do either.